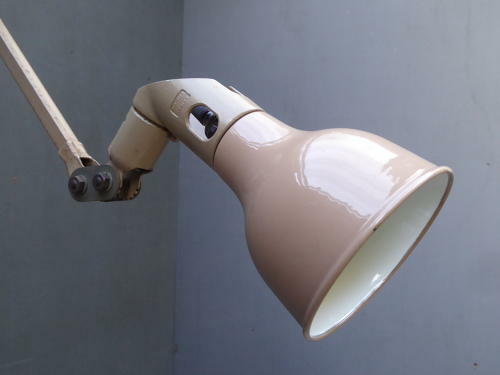 An original vintage industrial Mek Elek machinist lamp. A fantastic example in the scarce taupe colourway, stamped 'E.R' to the joints denoting its former government use & with the usual amazing build quality. In original paintwork with a good untouched patina & a near perfect enamel shade, the lamp makes a great wall, table or desk lamp. A great example. Wear commensurate with age, good overall condition. Measurement given(89cm) is a flat out measurement & overall height or reach depends on position. The lamp will need mounting to gain full use of its positions.